There are many situations where it’s really nice to have control, and driving around in style is one of them. Nothing says ‘I’m not messing around; I mean business here’ more than having your very own stylish luxury rental car in the Miami area. At Miami Art Cars, we know that cruising around in style is a big deal within the young and chic culture of Miami. With alternative taxi companies like Uber, Lyft and Z Trip becoming so commonplace (and arguably controversial) these days, being able to physically drive yourself from Point A to Point B sounds like a more attractive option every single day. That’s why our exotic car rental business in Miami is here for the drivers who don’t mess around, and for the drivers who truly enjoy the fine pleasure of driving for the sake of enjoyment. 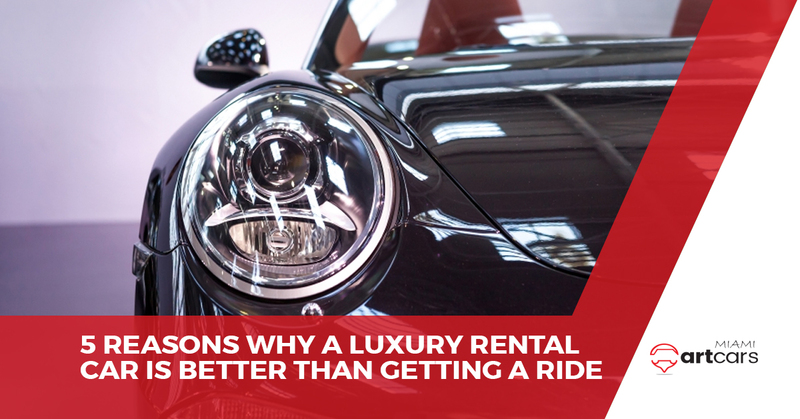 Today, we’re going to take a quick look at why getting a luxury rental car from Miami Art Cars is a better idea than getting a ride from a taxi service company. No one hails a Lyft or an Uber just to get to know their driver and get their life story. Wouldn’t it be nice to get to where you need to go without any of the B.S. during the drive? After all, you shouldn’t feel obligated to get to know your driver beyond a simple ‘yes please’ and ‘thank you.’ When you drive by yourself, you’re guaranteed a no-nonsense drive, but with a taxi service, there’s no telling who you’re going to get. This video illustrates the point quite nicely. We’re not saying that we don’t appreciate your shining reviews when it comes to using our Miami car rental service, but at least you aren’t prompted to submit a review after every single ride that you do. All we ask is that you simply give us a little feedback when you’ve returned your exotic car rental back to us, whether it’s a Range Rover, Maserati Levante, or even an American classic like the Ford Mustang. Getting an Uber or Lyft certainly doesn’t take that long, especially these days, but with a Miami rental car, you can hop in and take off right when you want to. Oh, you’re feeling hungry at 1:30 in the morning but the McDonald’s down the street is too far from your hotel? No one wants to call a taxi just to get some late night food. With your own ride from Miami Art Cars, not only do you have the convenience of leaving at your whim, but there’s no judgment from others involved! When it comes to your decisions, it’s just you and your conscience. While we prefer the true transportation experience of autonomously driving yourself around the city, taxi drivers do have lives and other people that they’re trying to give rides to. With your own car rental, you won’t have to randomly throw everything together at the last minute to get out the door in time for your ride. Simply take your time, collect your belongings, and enter your rental car at your leisure – it’s your rental, after all. In the context of penny-pinching and saving the Earth, yes, ridesharing is a good idea, but from a social perspective, it can often be downright awkward. At Miami Art Cars, we’re here to change that. When you’re in your very own exotic rental car, it’s just you and the radio – or as we prefer, you and the sound of that roaring engine when you put the pedal town (we do NOT condone reckless driving). Why Not Get Your Own Luxury Rental? Experience Miami like a pro when you get a nice, luxury rental car from Miami Art Cars. With a large fleet to choose from, we know that there’s the right option for you out there. Browse our fleet or get in touch with our friendly high-end car rental company!